I can't seem to stop creating with the Coffee Cafe bundle! I am seeing all sorts of wonderful designs all over the internet and I want to try them all. I kept being drawn to Dawn Griffith's blog - she did a few days of multiple projects using this bundle. I needed to make a thankyou card for the team manager for my daughter's basketball team and when I found out her gift was a gift card I couldnt resist making this mini coffee cup to match. I love finding ways to wrap gift vouchers to make them look a little more special. I am going to make up a batch for Christmas for sure. 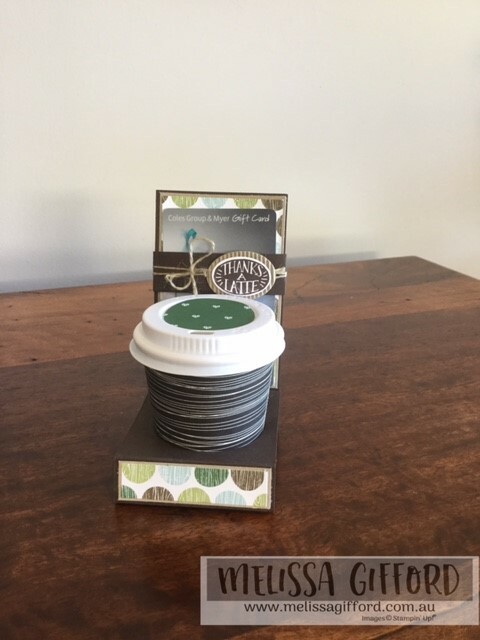 The mini coffee cups can be found at packaging supply shops or on ebay. They are 4oz cups with lids. This one I was lucky enough to find already patterned so I didnt feel the need to cover it - I just added a circle of designer series paper to the lid.